Seating in the new PAC. La Porte High school’s new Performing Arts Center is now open for use after the October 16th ribbon-cutting ceremony. The PAC is a long-awaited project within the arts department. 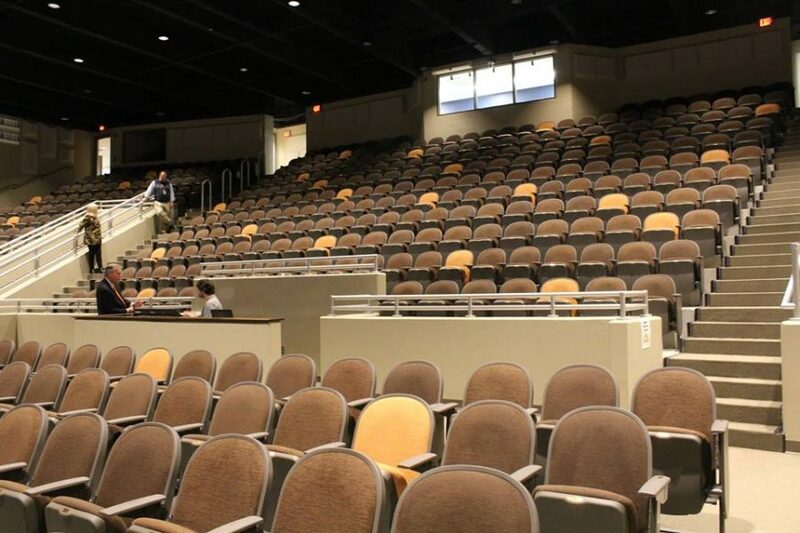 A facility with pleasant acoustics, vibrant lights and a professional sound system is a much-needed upgrade over the old auditorium. Also included is increased seating, a commons area, and a smaller, studio theater providing a more intimate setting. “As far as lighting, multimedia presentations, and a larger stage, much more should be possible,” Mickey Stisher, music department head, said. Because of these new possibilities, more performances are scheduled to take place in the upcoming seasons than in years past, including those from ensembles within the community. “There is much interest from outside of LPHS including other schools in our district as well as the LaPorte County Symphony in having performances and other events held here. Only time will tell what the capabilities will be,” Stisher said. The director of the PAC is Richard Snyder, a former Slicer and experienced thespian. “I wanted this position as soon as I heard about the plans for a new theater. I have spent most of my teaching career looking for a position where I could teach theater primarily. I want to see the new facility used to its potential, and I want to share my enthusiasm for Arts education,” Snyder said. Snyder is the instructor for a new Technical Theater class starting the second semester of the current school year. In that class, students are trained to handle and operate the all-new, state of the art technology within the facility. He, alongside theater director Lindsey Baugh, anticipate new opportunities for the theater department. “The spring show will be on the main stage, giving us that big theatre experience that we would have in a true professional theatre. It’s going to be an exciting year. The space is beautiful, and I cannot wait to see all that we can do in there,” Baugh said. With the addition of these new facilities and opportunities, the arts programs at LPHS are sure to be enriched by the PAC. Upcoming performances at the PAC include the LPHS Orchestra concert on the 24th and the Fall Play.